*Use a band if necessary! **No squat required. If Snatches are not in the repertoire, a moderate Russian KB swing can be used. Wishing you all a great Holiday season! We are grateful for what each of you bring to our community, day in and day out. We would not be who we are without you! Thanks for the great year! Just a reminder to head here if you need a reminder of our holiday schedule! We close today @ 1PM and we are CLOSED ALL DAY tomorrow! Day after Christmas, we OPEN AT NOON and have a regular class schedule the rest of that day. We wish you a healthy, happy and safe holiday! We hope you are able to spend time with loved ones! Athletes will have 20 minutes to build to and complete 4 sets of 2 at an RPE of 8-9. This means they should feel they have 1-2 reps in the tank. Next week is a deload week. Athletes may wear lifters and belts and should ask a coach for a spot if they need. 9AM Class - GOODBYE JOSH! Today we say goodbye to a staple from our coaching staff - and it is tough. Josh’s departure has, admittedly, snuck up on us (me specifically). But it got me to thinking of how grateful we are to have had Josh on our crew for the past three and a half years. I remember the first time I met Josh. I myself had just recently started getting into the fold at Kingfield at as a coach. It was likely around April or May of 2015 (but who cares about specifics?). I came into the gym one day and there was this powerfully-built, long-haired blonde guy lifting on our weightlifting blocks. He had on spandex pants, a white t-shirt and a backwards hat. And boy could move weight! At least to my (relatively) untrained eye. I don’t even think we were introduced that day. He was quiet and pretty shy. I found out he was dating one of our members and that she had brought him by to check out her “happy place.” He never left. Over the coming months and years, I learned more and more about Josh: how he was born in Arkansas but has lived in more places than I care to count right now pursuing a professional hockey career. We connected on our mutual passion for goaltending, albeit in different sports. I learned that he’s an only child and that he came to us by way of Madison, WI. Beyond his personal stat sheet, I got to know his character. Josh is one of the good ones, folks. I know I don’t have to tell you that but I have often thought that he is one of the nicest, genuinely kind souls I have ever met. He puts others before self without question. He always steps up - there are countless times that Josh has been asked to help out last minute and he always shows up. He is a utility guy, with a versatility and eagerness to contribute that will take him a long way into the future. Josh, this community won’t be the same without you. Our staff won’t be the same without you. Whether it’s your “whoo hoo’s” or your infectious smile, you will be missed. Athletes will have 20 minutes to build to and complete 3 sets of 3 reps at an RPE of 8. We will be building over the next three weeks with a focus on position and control under heavy load. Any scaling option may be used for any movement. Bands for pull-ups, ring rows, kipping and C2B if desired. Push-ups can be done to a yoga block, with a pause, strict or hand-release. Sit-ups are abmat sit-ups and air squats are air squats. Long Live RPE: What is it and why do we use it? Rate of perceived exertion (RPE) is an accepted and effective method for gauging effort in most exercises. It can be used for a variety of modalities (cardiovascular, musculoskeletal, neuromuscular, etc.). In this article, we will share with you two different charts for RPE and how the different levels might be explained depending on the type of exercises you perform. Because effort is relative. The body is affected by a wide variety of inputs, some good and some bad, all of which affect its ability to perform. When it comes to peak performance, we typically are placing demands on the body that require optimal conditions: proper nutrition, hydration and sleep, ideal temperature, zero external stressors, peace of mind…we can dream, right? Rarely when you’re in the gym are you operating under these conditions. Typically, at least one of those variables (if not multiples of them) is not optimal which will affect your performance. SO, if you come into the gym and you’re supposed to Back Squat 85% of your 1RM for 3 x 3 and you are off, more than likely you’re going to feel (slightly) defeated. We, your coaches, set the expectation that you should have been able to hit that weight for that volume today and you couldn’t. To me, that doesn’t sound very motivational. The demands are unrealistic given your reality. Similar scenario, you’re a little off today but the board says Back Squat RPE of 8 for 3 x 3. Cool! I’m going to work up to a weight that I feel I could perform 3 solid back squats plus a few more reps and repeat for 3 total sets. The RPE allows you to dictate based on your reality. This can skew the other way too - maybe you come in feeling really really good! You’re able to load the bar up to something closer to 90% but it feels like an RPE of 8 today because you slept well, ate well and crushed it at the office today. Adrenaline is flowing and you’re going to ride that wave! This is why we use it. And these graphics should give it some context. The first one (below) shows RPE as it relates to cardiovascular exercise. In CrossFit, we’d refer to these as our “metcons” and sometimes we prescribe an RPE for a specific element (i.e. Bike for 0:60 @ RPE 7). 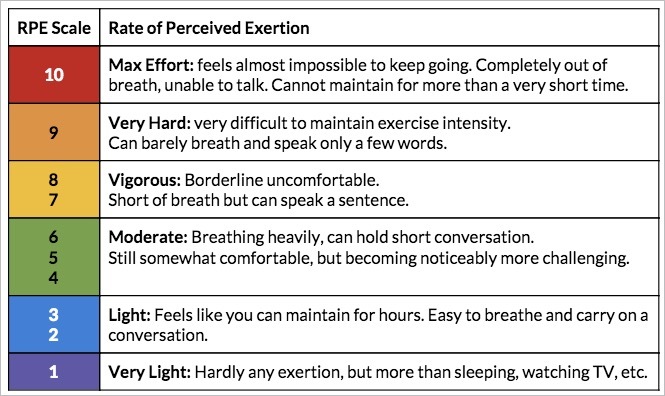 From this chart, we see that an RPE of 7 on the bike should leave us short of breath but can speak a full sentence. In the second graphic (below), we see the RPE chart for weightlifting. You can see how those sets of 3 from our earlier back squat example that the weight should be such that you definitely could have done two more reps on each set. It’s my hope that these charts and this post can help shed some light on that mysterious RPE you keep hearing about and seeing in classes. This is the direction that most prescription based exercise is trending towards, acknowledging the relativity of each individual to perform on any given day. *Athletes may choose to use the ski erg if their coach agrees. Front rack weight should top out ~115/85. Athletes should have the goal to maintain good position in the hold for the entire minute each round. If you are unsure what to use, talk to a coach. Consider the same idea with the KB weight too - pick something you can move efficiently and effectively for 4 sets of 21 unbroken KB swings. And we get paralyzed. We pick one, we try it on. It works for a few weeks or months (maybe even years) and then it stops. So we pick another one. Boom! Results right away followed by the inevitable plateau and, sometimes, regression. We feel defeated and sad. We blame our genetics (sometimes valid) or our work-life balance. We wonder how we can work out so much but still not lose the weight (hint: abs really are made in the kitchen). We restrict our eating to the point of upsetting Grandmas at the holidays because you won’t partake in her famous homemade baked goods. We stress about going out to eat with friends because what will we order? So how do you solve the great diet conundrum? I will give you two principles that can hopefully help guide your search for best way for you to eat. Actually, that’s principle #1: find a way to eat that is best for you. Just because something is touted as healthier or most effective, doesn’t mean it’s the best approach for you. A lot of different approaches to eating can be used as tools to meet your goals but at the end of the day, you want to find a way of eating that balances health and enjoyment. If you like steak and cheese, eat steak and cheese - this doesn’t mean you’re “Keto.” If you like veggies and fruits, eat veggies and fruits - this doesn’t mean you’re “vegetarian.” If it makes you feel good, supports the things you love to do and you can see yourself doing it easily for a long time, do it. Which leads us to principle #2: figure out how you can eat long-term. You gotta eat. It will always be a part of your biology. It supports your activities, fuels your brain and most social engagements (natural and essential to human survival) center around food and/or beverage. Forcing yourself into a lifestyle that restricts our food or drink habits aggressively with no definitive endpoint will be quickly defeating. It’s also not sustainable - barring some medical condition that keeps you from consuming a certain food or drink to which you have to say no, we aren’t built to constantly resist. In fact the stress of saying “no” can often counteract our best intentions, primarily through elevated levels of a hormone called cortisol. Cortisol, among its many functions, promotes fat retention. Back when we were cave people, cortisol would be released in times of scarcity so we would store energy because food supply was scarce. Life was literally a question of survival back then and the body has some pretty sweet mechanisms in place to keep us alive. Unfortunately for us, that biology hasn’t changed as much as the times have. Cortisol still behaves in the same way but our stressor are - let’s face it - less extreme. The outcome? Constantly having to turn down your friends for happy hour drinks or restricting your caloric intake will cause stress similar to that we would experience when trying to hunt and kill our food. The hormonal response remains the same. So next time you’re beating yourself up about “falling off the wagon” or feel overwhelmed by information about how you should be eating, remember these two principles and ask yourself: can I do that? and can I do that long-term? If the answer to either of those are no, then it’s likely that what you’re considering is simply a tool. You can use it for a time and may even see some positive changes as a result. But you need to remind yourself that it’s not forever and that you still likely need to do some work to determine what your long-term strategy will be. *I understand that some of these dietary choices are for moral or personal reasons. They are listed at the top of this article because they are part of the cycle of dietary information regularly consumed by health-conscious individuals.